Sometimes I buy a bunch of craft beers for a get together and they always seem to come in those oversized bottles. Then at the end of the night, there are a bunch of half-full bottles left and I have no choice but to dump them out. 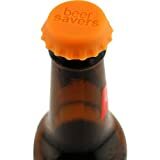 At least that used to be the case until I came across Save Brands Silicone Rubber Beer Savers. They really couldn’t be simpler… they’re just silicone bottle caps. But they fit your bottles perfectly to keep your beer (or soda) fresh overnight in the bottle, and it’s only $7 and change for a 6-pack.